The Department of Buildings has posted on its website a “Notice to Revoke” permits for the 668′ tower at 200 Amsterdam! 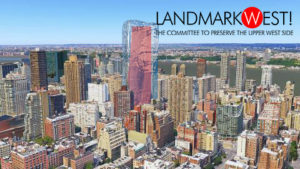 This action is in direct response to the Zoning Challenge filed by the Committee for Environmentally Sound Development and supported by LANDMARK WEST!, Friends of the Upper East Side Historic Districts, and five elected officials. WITH YOUR HELP, LW! applied additional pressure to Mayor Bill de Blasio himself (read our letter here, echoed by hundreds of emails from New Yorkers LIKE YOU!). EMAIL key officials to reinforce community concerns about over-sized development creeping into residential neighborhoods like the Upper West Side. Use this simple, automated email template to contact NYC leaders today! 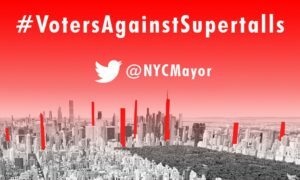 USE SOCIAL MEDIA to post #VotersAgainstSupertalls @NYCMayor (this lets the Mayor know that you expect our city’s top leader to protect the rights of everyday citizens against neighborhood overdevelopment) – click here to learn more about this growing movement. SUPPORT this effort with a tax-deductible contribution to help LW! build a fund to fight this project. You can earmark your donation by giving online here or writing “LW! Fund to Fight 200 Amsterdam” in the memo of your check made payable to LANDMARK WEST! (we are a 501c3 nonprofit) and mailed to 45 West 67th Street, NYC 10023. Together, we are making a difference – THANK YOU!